In response to this debate, the Greeks can offer another perspective on the matter. To be historically accurate Cleopatra bore the ancient Egyptian title of pharaoh, however the Ptolemaic dynasty was Hellenistic, having been founded 300 years before by Ptolemy I Soter, a Macedonian Greek general of Alexander the Great. As such, Cleopatra’s language was the Greek spoken by the Hellenic aristocracy. As a result of historical facts somebody could argue that the role of Cleopatra should not go to a woman of color or Angelina Jolie, but to an actress of Greek origin. A great candidate could be Greek-American Jennifer Aniston. The new project is based on the biography “Cleopatra: A Life”. will smith played the part on film. Interesting to find out about the origin of Cleopatra. I’ve always known her to be black from back at work when we had international festival w/ the blacks coming out w/ their history & Cleopatra. When news came out abt Jolie’s project (& she is involved in the development of it, more so to glorify herself again), I thought Alicia Keys would have been the perfect one for the role…….and now you gave me something I am so ecstatically happy about. Jennifer Aniston, who is a Greek goddess in my eyes, should have that role. She once was pictured wearing a long Greek printed dress by paps coming out from her house, her hair up…….a few males have notice & posted “like a Greek goddess”……Ahh….hollywood always go for longtime movie actresses, never for a previous TV multi-awarded actress. Are you kidding? Aniston is a horrible actress who makes godawful movies. Where have you been? There are much better actresses of Greek descent, and have trained in the dramatic arts (Kanakareides, the actress on Law & Order for instance), who would be a better fit. I guess you’re just being snarky, suggesting Angelina’s ‘tabloid’ rival (the deluded, insane tabloid rantings are the only places Aniston would rival Jolie – the world of fiction). Jennifer ‘TV hacktress’ Aniston has neither the acting talent, nor the charisma, nor the empowering strength and intense sexuality to play such a commanding role, she may indeed be perfect in just ONE respect; the original Cleopatra was said to be quite homely, and in that respect, Aniston would be perfect. There are too many young actresses out there to play this part. Cleo was a YOUNG and vibrant woman. Angie is a great actress, but she is too old for this part. I think young Hollywood needs to be given a chance. Angie is beautiful, but I have seen others that look sooo much better, and fresher! I think that this part should be further researched and Angie is just too old for this part…she looks great, but too old for the part. She lacks the softness in the face…you can see her age. Again, great actress, WRONG PART!!!!! Jennifer Aniston is awful I do not care what descent she is! Keep these updates on her coming. Angelina Jolie is amazing. A celebrity I both respect and love. Look forward to seeing her next film. The original painting I own of her is stunning and will be kept forever! Jennifer Ansiton isn’t always awful. Remember the movie “The Good Girl”? She got some really good acclaim for it. She was even nominated for awards like the prestigious Indepence Spirit Award. Besides she looked kind of like cleopatra. Look at the statue of cleopatra and the pictures of jennifer aniston. To my biased opinion she could do it. First of all Cleopatra was attractive to the Roman’s not because of her physical beauty, but because of her linage to Alexander the Great. The man, through his cunning, military organizational skill, military tactics and leadership had conquered the then known world and on his return from India died and his body placed at the Great Library in Alexandria Egypt named of course in his Honor. The Romans were emulating the Classical Greeks especially Alexander. Mainly because by engaging in wars of conquest using his tactics could make you very rich. For a Roman Politician like Julius Ceasar, or later Augustus and Mark Antony, to be associated with The Great Alexander could lead to Greater Political power and wealth. One might need an emergency or crises to gain ultimate political power as dictator and do away with the Republic and centralize the power in one man as Alexander had done or Julius Ceasar had tried to do before the Roman Senators assinated him. In Roman culture you spoke two languages, the more base common language, Latin, and Greek and it was how well you spoke Greek that showed your, how well you were educated, social status and rank. So the more Greek you could appear, the more like Alexander, the Greater your appeal to the Roman populace. So Cleopatra with her linage to Alexander, in fact his body still lay in Alexanderia, with his armor three hundred years after his death. Let’s just say Cleopatra’s appeal to the Roman Political elite was overwelming. As for who should play her. Cleopatra was certainly aware of her appeal to the Romans and played her cards as best she could to try to remain autonoumus from Rome. Unsuccessfully, unfortunately. Egypt was absorbed into the Roman Empire after her death. Jennifer Aniston is only partially Greek and she is Creatian Greek. Alexander was Mesopitanian Greek. Far to the North and of a different linage entirely. Creatians are Minoan and Mycennian. The Minoans were not war like at all and predated the later Mycennian culture of Homer’s time and the Classical Greeks that Alexander was emulating. Minoans had the Labrys and Bull, God and Goddess worship, some say more Goddess and matriarcal, certainly not a culture based around a strong man like Alexander. So while Aniston is technically Greek her ancestry may be farther removed than Angelina’s. Angelina’s image as an action hero, the Minoans would refer her personality as more leaning toward the masculine Bull side of the equation between the Labrys and Bull,God and Goddess, which would seem a better match for Cleopatra. Like an Amazon. A woman who fights like a man, but fights under the flag of the Labrys or Goddess preserving her femaleness under a coating of masculinity. IM EGYPTIAN, AND I SAY GIVE THE ROLE TO A YOUNG EGYPTIAN ACTRESS. PERIOD. NOT SO DIFFICULT! Wow!! What a coincidence they want it to go to Jennifer Aniston. I really don’t think she has what it takes to play the role. The film cleopatra is not just about an eqyptian woman, but about a fearless, brave, and feminist woman. A role that clearly screams Angelina. Peolple need to get over race. It is a Hollywood American film after all. The part should go to the person that best fits it. Read the storyline of the film and of the character in this new film and many couldn’t argue that it should go to Angelina. Part of being an actor/actress is being able to transform yourself into someone else. No matter the ethnicity. Really people!!!! So annoying! Are you kidding Aniston as Cleopatra. She has no natural sensuality at all. Angelina was breathe taking in Alexander. Aniston could not even be considered for such a role..she canot even get in the same arena with Jolie. Sweetie…Cleopatra was not Egyptian…do your homework…she was GREEK! To be truthful about Cleopatra, she was of mixed Egyptian-Greek decent, but history is written and statues are sculpted from the victor’s perspective (in this case Greek). In any event, to be Egyptian-Greek was to be of mixed race. So to be historically accurate, Cleopatra would be played either by an Egyptian actress or other marketable actress who can make culturally-sensitive patrons believe the actress could have represented Cleopatra. Halle Berry was born to play this role immediately after her Oscar in 2002. Unfortunately, in 2011 she is age 45 and missed the window to play this character who should appear to be age 27-32-ish like Elizabeth Taylor (who was age 31 in the role). Age 36 Angelina Jolie is the studio’s first choice due to her marketability and we’ve seen Angelina as the realistic Greek mother of Alexander. But African Americans (including those who like Angelina as an actress/humanitarian) will boycott the movie due to neither an Egyptian or Halle Berry-type actress getting the role. A second reason to not cast Angelina is that we’ve also seen a sensual European beauty play this role (). There is nothing new Angelina would bring to and Elizabeth Taylor redux of the character. If the studio also cares attracting box office patrons of African descent and wants a longer video shelf life for attempting to be historically accurate, bringing/simulating an Egyptian perspective of the character, they should cast age 36 Paula Patton. She has a long its of TV credits and her movie credits include Deja Vu, Swing Vote, Mirrors that have attracted $285 million box office and she also plays a co-star role in the upcoming Mission Impossible. Guess Chita is out now that she passed away! Cleopatra was actually of mixed race- Egyptian and african. Cleopatra is 100 % Greek Ptolomeos descent. Actually Cleopatra, father was of Greek heritage. Her mother was Ethiopian. If you are going to make an accurate portrayal of anyone, it should be an accurate portrayal!!!! Never say to a Black person or African American, “To Get Over It”. This is rude and disrepectful to a race of people. Egyptian culture was not absorb into the Roman and Greek empire, but was destroyed by the Roman Empire. The Romans tried to erase all evidence of the African, Egyptian heritage. But, the evidence seemed to have remained. Not true. And she was Greek. Her father was. Her mother was Ethiopian. Look up the information on the bones found on her sister. I donot know where you people get all this nonsense. I mean she wasn’t Greek!! Mr. Dorsey, I think I am in love. I don’t always agree with many people on the internet, but I agree with you. Paula Patton may be good, but I still like Halle Berry, or an actress of Egyptian/Greek heritage. You sound, intelligent and objective in your writings. A lot of people really donot know their history, or do not make any attempt to research history properly. I am glad you made these accurate statements. Thank you. Read, research your history. You are sooooo wrong!! I think the role could be play by Angie Harmon, she has Greek origins and she is the perfetc mixture between these aesthetic stereotype of beautiness. GOD why r u so re tar ded? Cleopatra’s as greek as Megan Fox’s Russian! nobody cares I can’t even tell an Egyptian from a Greek as long as they don’t open their mouth! To the rest of the world Cleopatra is Egyptian period! Jennifer Aniston’s not representant of Greeks, she’s blonde, you and most of your ppl look latin or from Sicily so chill cuz nobody really cares. Angelina as Cleopatra this is so wrong!!!!!!!!!!! Actually you’re wrong Cleopatra’s father was not Greek. He was actually from Ethiopia. Her sister was her half sister, not a full blooded sister. 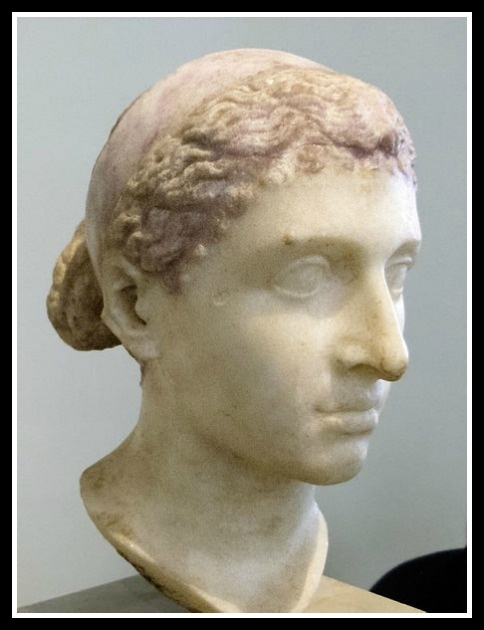 Cleopatra would have most likely had classic Greek features, like this bust made in her likeness. Cleopatra was not black or Ethiopian. Her father had children with more than one wife, bonita5064, he sister was her half sister, she had a different mother. You are 100 % wrong. Her father was a Ptolemy, they were Greek Macedonian decent, not Ethiopian. Yes she was. She is a descendant of Ptolemy I, the Ptolemys followed the Egyptian custom of marrying siblings. Her mother was most likely her father’s sister or half sister. Also her sister was not a full blooded sister, they had different mothers. Cleopatra’s sisters mother was a concubine of her father. I’ve read several books on this subject, not just one Internet article.